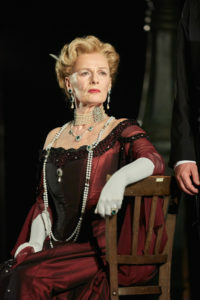 The National Theatre of Great Britain’s Landmark production of J. 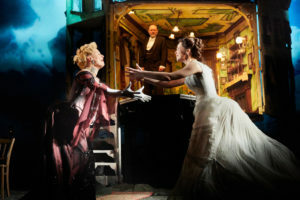 B. Priestley’s An Inspector Calls is an appropriate interpretation of the play, a classic thriller of the drawing room theatre. Mystery buffs will love this play. The material is written well, but old-fashioned compared to written works today. However, the stark contrast of the privileged class against the poor was as striking then as it is in 2019. The author, J.B. Priestley was a socialist and this elucidated the reason director Stephen Daldry chose to theatricalize the class distinction of the 1912 Victorian era with symbolism throughout. Daldry knew what he was doing (even if the audience may not have) with the staging of the ensemble dressed in common clothes juxtaposed alongside the wealthy main characters in their beautiful garments at different intervals of the story. My favorite character in the production of An Inspector Calls is the ingenious design of the Victorian House the Birling family resides in. Transforming and shape shifting with the unfolding of the plot was marvelous. Applause to Ian Macneil (Designer) who created a “character” in the house. The story revolves around the suicide of a young poor girl and an Inspector determined to bring justice by finding the perpetrator. He targets a wealthy family, the Birlings with his relentless questionings. As the play progresses and his interrogations deepen what we discover are secrets of the family members. What we unfortunately do not discover is a likeable character. Actually, not true. The only likeable character is the one spoken of but not seen – the young girl who belonged to the struggling poor class. The cast and ensemble were successful in their portrayal of the societal disconnect. Christine Kavanagh (Sybil Birling) is a well-crafted actress, and her performance was most enjoyable. Liam Brennan as Inspector Goole hit all the high and low tones of the character and carried the play effectively. 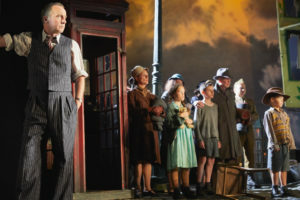 Other members of the cast include Jeff Harmer (Arthur Birling), Andrew Macklin (Gerald Croft), Lianne Harvey (Sheila Birling), Hamish Riddle (Eric Birling) and Diana Payne-Myers (Edna). This production was on Opening Night, January 23, 2019 at Wallis Annenberg Center for the Performing Arts in the Bram Goldsmith Theater.